For the song by the 4 Non Blondes commonly referred with the same name, see What's Up? For other uses, see What's Going On (disambiguation). "What's Going On" is a song by American recording artist Marvin Gaye, released in 1971 on the Motown subsidiary Tamla. Originally inspired by a police brutality incident witnessed by Renaldo "Obie" Benson, the song was composed by Benson, Al Cleveland and Gaye and produced by Gaye himself. The song, which focused on major seventh and minor seventh chords, and was oriented in sounds by jazz, gospel and classical music orchestration, was mainly viewed as a meditation on the troubles and problems of the world, proving to be a timely and relatable release, and marked Gaye's departure from the Motown Sound towards more personal material. Later topping the Hot Soul Singles chart for five weeks and crossing over to number two on the Billboard Hot 100, it would sell over two million copies, becoming Gaye's second-most successful Motown song to date. The song topped Detroit's Metro Times list of the 100 Greatest Detroit Songs of All Time, and in 2004, Rolling Stone magazine ranked it the fourth-greatest song of all time; in its updated 2011 list, the song remained at that position. It is included in the Rock & Roll Hall of Fame's 500 Songs that Shaped Rock and Roll list, along with two other songs by the singer. It was also listed at number fourteen on VH-1's 100 Greatest Rock Songs. The song's inspiration came from Renaldo "Obie" Benson, a member of the Motown vocal group the Four Tops, after he and the group's tour bus arrived at Berkeley on May 15, 1969. While there, Benson witnessed police brutality and violence in the city's People's Park during a protest held by anti-war activists in what was hailed later as "Bloody Thursday". Upset by the situation, Benson said to author Ben Edmonds that as he saw this, he asked, "'What is happening here?' One question led to another. Why are they sending kids so far away from their families overseas? Why are they attacking their own children in the streets?" Upset, he discussed what he witnessed to friend and songwriter Al Cleveland, who in turn wrote and composed a song to reflect Benson's concerns. Benson wanted to give the song to his group but the other Four Tops turned down the request. "My partners told me it was a protest song", Benson said later, "I said 'no man, it's a love song, about love and understanding. I'm not protesting, I want to know what's going on.'" In 1970, Benson presented the untitled song to Marvin Gaye, who added a new melody and revised the song to his liking, adding in his own lyrics. Benson later said Gaye tweaked and enriched the song, "added some things that were more ghetto, more natural, which made it seem like a story than a song... we measured him for the suit and he tailored the hell out of it." Gaye titled it "What's Going On". When Gaye initially thought the song's moody feel would be appropriate to be recorded by The Originals, Benson convinced Gaye to record it as his own song. Gaye, himself, had been inspired by social ills committed in the United States, citing the 1965 Watts riots as a turning point in his life in which he asked himself, "'With the world exploding around me, how am I supposed to keep singing love songs?'" Gaye was also influenced by emotional conversations shared between him and his brother Frankie, who had returned from three years of service at the Vietnam War and his namesake cousin's death while serving troops. During phone conversations with Berry Gordy, who was vacationing in the Bahamas at the time, Gaye had told Gordy that he wanted to record a protest record, to which Gordy said in response, "Marvin, don't be ridiculous. That's taking things too far." Gaye entered the recording studio, Hitsville USA, on June 1, 1970 to record "What's Going On". Instead of relying on other producers to help him with the song, Gaye, inspired by recent successes of his productions for the vocal act, The Originals, decided to produce the song himself, mixing up original Motown in-house studio musicians such as James Jamerson and Eddie Brown with musicians he recruited himself. The opening soprano saxophone line, provided by musician Eli Fontaine, was not originally intended. Once Gaye heard Fontaine's riff, he told Fontaine to go home. When Fontaine protested that he was just "goofing around", Gaye replied "you goof off exquisitely, thank you." The laid-back atmosphere in the studio was brought on by constant marijuana smoking by Gaye and other musicians. Jamerson was pulled into the session after Gaye located him playing with a band at a local bar. Respected Motown arranger and conductor David Van De Pitte said later to Ben Edmonds that Jamerson "always kept a bottle of [the Greek spirit] Metaxa in his bass case. He could really put that stuff away, and then sit down and still be able to play. His tolerance was incredible. It took a hell a lot to get him smashed." The night Jamerson entered the studio to record the bass lines to the song, Jamerson couldn't sit properly in his seat and, according to one of the members of the Funk Brothers, laid on the floor playing his bass riffs. De Pitte recalled that it was a track that Jamerson greatly respected: "On 'What's Going On' though, he just read the [bass] part down like I wrote it. He loved it because I had written Jamerson licks for Jamerson." Annie Jamerson recalls that when he returned home that night, he declared that the song they had been working on was a 'masterpiece', one of the few occasions where he had discussed his work so passionately with her. Gaye also added his own instrumentation playing piano and keyboards while also playing a box drum to help accentuate Chet Forest's drumming. To add more to the song's laid-back approach, Gaye invited the Detroit Lions players Mel Farr and Lem Barney to the studio and, along with Gaye and the Funk Brothers, added in vocal chatter, engaging in a mock conversation. Musician and songwriter Elgie Stover, who later served as a caterer for Bill Clinton and was then a Motown staffer and confidante of Gaye's, was the man who opened the song's track with the words, "hey, man, what's happening?" and "everything is everything". Later Gaye brought Lem Barney and Mel Farr with him to record the song's background vocal track with him. The rhythm tracks and the song's overdubs were done at Hitsville, while strings, horns, lead and background vocals were recorded at Golden World Studios. On hearing a playback of the song, Gaye asked his engineer Kenneth Sands to give him his two vocal leads to compare what he wanted to use for the song's release. Sands ended up mixing the leads together, by accident. However, when he heard it, Gaye was so impressed with the double-lead feel that he kept it, influencing his later recordings where he mastered vocal multi-layering adding in three different vocal parts. Before presenting the song to Gordy, he produced a false fade to the song, bringing the song back for a few seconds after it was initially to have ended. The song was also notable for its use of major seventh and minor seventh chords, which was a fairly uncommon use at the time. Gaye recorded the song's b-side, "God Is Love", on the same day. When Gordy heard the song after Gaye presented the song to him in California, he turned down the request to release it, telling Gaye he felt it was "the worst thing I ever heard in my life". When Harry Balk requested the song to be released, Gordy told him the song featured "that Dizzy Gillespie stuff in the middle, that scatting, it's old". Gaye responded to this rejection by refusing to record material unless the song would be released, going on strike until, he felt, Gordy saw sense in releasing it. When Gordy tried to convince Smokey Robinson, who was one of the few in the Quality Department to take favorably to the song, to get Gaye to change his mind, Robinson simply told him that to do so would be "like a bear shitting in the woods, Marvin ain't budging". Anxious for Marvin product, Balk got Motown's sales vice president Barney Ales to release the song, releasing it on January 17, 1971, sending 100,000 copies of the song to radio stations across the country. The initial success of this led to a further 100,000 to reach demand, selling over 200,000 copies within a week. The song was issued without Gordy's knowledge. The song eventually became a huge success, reaching the top of the charts within a month in March of the year, staying at number-one for five weeks on the Billboard R&B charts and one week at number-one on the Cashbox pop chart, while reaching number-two on the Billboard Hot 100. Billboard ranked it as the No. 21 song for 1971. The song eventually sold more than two million copies, becoming then the fastest-selling Motown single at the time. The song's success forced Gordy to allow Gaye to produce his own music, giving him an ultimatum to complete an album by the end of March, later resulting in the What's Going On album itself. The song was reviewed by Slant magazine as a song that presented a contradictory sound, with the song's mournful tone going in contrast to the party atmosphere of the vocal chatter. In reviewing the What's Going On album, Rolling Stone critic Vince Aletti stated that while the song's lyrics were "hardly brilliant", the song itself helped to set the mood for the rest of the album, and that "without overreaching they capture a certain aching dissatisfaction that is part of the album's mood." "What's Going On" was nominated for two Grammy Awards in 1972 including Best Male R&B Vocal Performance and Best Arrangement Accompanying Vocalist(s), but failed to win in any of the categories. In 2004 and 2010, the song was ranked #4 on the Rolling Stone list of "The 500 Greatest Songs of All Time", making it the highest Marvin Gaye song on the list. In 1999, music writers Paul Gambaccini and Kevin Howlett listed the song #74 on BBC Radio 2's Songs of the Century. In 2003, Q magazine placed the song 64th out of its 1001 Best Songs Ever. In 2004, the Detroit music newspaper Metro Times named it the #1 "Greatest Detroit Song of All Time" out of 100 songs on the list. It also reached #14 on VH-1's 100 Greatest Rock Songs of All Time. In March 2012, New Musical Express named it the #33 Greatest 1970s song on their list. Cyndi Lauper covered "What's Going On" on her second album, True Colors, in 1986. In March 1987, it was released as the third single from the album. On the album version, the song starts off with a series of gunshots in reference to the Vietnam War while the single release is a remix with an alternate vocal used in the intro. It is the single version that most often appears on Lauper compilations. Lauper's cover was a modest hit worldwide. Thanks to club remixes by Shep Pettibone, the song reached #17 on the U.S. dance chart. However, the song failed to reach the US top ten unlike Lauper's previous two singles from her True Colors album including the title track and "Change of Heart", reaching #12. The video for the song, directed by Andy Morahan, was nominated for an MTV Video Music Award. "A Cool Wind Is Blowing"
The remake of "What's Going On" was the first of the Rock Aid Armenia releases in aid of earthquake victims in the 1988 Armenian earthquake. The version credited to Live Aid Armenia featured Aswad, Errol Brown, Richard Darbyshire, Gail Ann Dorsey, Boy George, David Gilmour, Nick Heyward, Mykaell S. Riley, Labi Siffre, Helen Terry, Ruby Turner, Elizabeth Westwood and the Reggae Philharmonic Orchestra. The B-side was "A Cool Wind Is Blowing", Armenian duduk music played by Djivan Gasparyan. The record was produced by Steve Levine and the executive producers were Fraser Kennedy and Jon Dee. This was released as a single on Island Records. 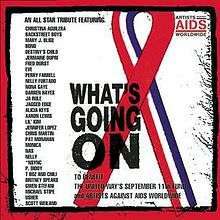 On October 30, 2001, a group of popular recording artists under the name "Artists Against AIDS Worldwide" released an album containing multiple versions of "What's Going On" to benefit AIDS programs in Africa and other impoverished regions. Jermaine Dupri and Bono produced the radio single version, whose performers included Britney Spears, Ja Rule, Nas, Christina Aguilera, NSYNC, Gwen Stefani, Jennifer Lopez, Ginuwine, Brandy, Nelly Furtado, Fred Durst of Limp Bizkit, Solange, Missy Elliott, Destiny's Child, Lauryn Hill, Wyclef Jean, 3LW, Backstreet Boys, Monica, Gaye's own daughter Nona, and many other popular artists. The album contained that single along with 8 additional remixes. The song was recorded shortly before the September 11, 2001 attacks, and it was decided afterwards that a portion of the song's proceeds would benefit the American Red Cross' September 11 fund as well. A music video was directed by Jake Scott. Chaka Khan performed a version of the song with The Funk Brothers on the documentary, Standing in the Shadows of Motown, in 2002. The performance resulted in a win at the 45th annual Grammy awards for Best Traditional R&B Vocal Performance. ↑ "Marvin Gaye - 45 years ago! Marvin Gaye's "What's Going...". Facebook. 2016-01-20. Retrieved 2016-06-03. ↑ Classic Tracks Back To Back Singles. Thunder Bay Press. 2008. p. 125. 1 2 3 Edmonds, Ben (2003). Marvin Gaye: What's Going On and the Last Days of the Motown Sound (book). Canongate U.S. ISBN 978-1-84195-314-4. ↑ "The 100 Greatest Detroit Songs Ever!". Retrieved September 8, 2012. ↑ "500 Greatest Songs of All Time: Marvin Gaye, 'What's Going On'". April 7, 2011. Retrieved September 8, 2012. ↑ "Experience the Music: One-Hit Wonders and the Songs That Shaped Rock and Roll". The Rock & Roll Hall of Fame & Museum. Retrieved July 5, 2012. ↑ "Rock On The Net: VH1: 100 Greatest Rock Songs 1-50". Retrieved September 8, 2012. 1 2 3 4 5 Lynskey 2011, pp. 155. 1 2 3 4 5 6 7 8 Lynskey 2011, pp. 157. 1 2 Lynskey 2011, pp. 156. 1 2 3 4 "Marvin Gaye 'What's Going On?'". July 11, 2011. Retrieved September 8, 2012. ↑ Licks, Dr (May 1989). Standing In The Shadows Of Motown: The Life and Music of Legendary Bassist James Jamerson (book). Hal Leonard Corporation. p. 62. ISBN 978-0-88188-882-9. ↑ "Barbecue Grill Showman Never Skipped Beat". Retrieved May 8, 2012. ↑ Bowman 2006, pp. 15. 1 2 Bowman 2006, pp. 16. ↑ "Marvin Gaye: What's Going On". Retrieved September 8, 2012. ↑ "What's Going On Album Review". Rolling Stone. May 5, 1971. Retrieved September 8, 2012. ↑ "BBC RADIO 2 - SONGS OF THE CENTURY". Retrieved September 8, 2012. ↑ "Rocklist.net....60 Years Of The NME". Retrieved September 8, 2012. ↑ Garcia, Alex S. "mvdbase.com - Cyndi Lauper - "What's going on?"". Music Video DataBase. Retrieved October 31, 2015. ↑ Kent, David (1993). Australian Chart Book 1970–1992 (Illustrated ed.). St Ives, N.S.W. : Australian Chart Book. p. 173. ISBN 0-646-11917-6. N.B. The Kent Report chart was licensed by ARIA between 1983 and 19 June 1988. ↑ "Life Aid Armenia - Whats Goin On (CD)". Discogs.com. 2012-05-07. Retrieved 2016-06-03. ↑ "Time Calculator". Unitarium.com. Retrieved 2012-08-15. ↑ Visty, Beverly (30 October 2001). "Artists Against AIDS Worldwide's New Superstar Version of Marvin Gaye's 'What's Going On' in Stores Tuesday, October 30" (Press release). Los Angeles: Artists Against AIDS Worldwide. Archived from the original on 25 August 2003. Retrieved 2014-09-29. ↑ "What's Going On: All-Star Tribute > Charts & Awards > Billboard Singles". allmusic. Retrieved June 1, 2010. ↑ "45th Annual Grammy Awards Winners". grammy.com. Retrieved January 18, 2015.